Liberals are looking to shore up the electoral system from foreign meddling. 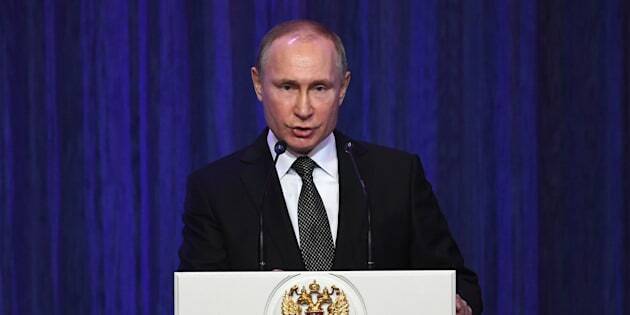 Russian President Vladimir Putin delivers a speech in Moscow on Feb. 22, 2018. Russia is attracted to Canada because destabilizing it would "undermine the cohesion" of the broader NATO alliance. Moreover, it could serve to undermine Canadian policy in Europe, he said. It would also allow Russian President Vladimir Putin to project strength inside his country by showing that "other countries are afraid of Russia," said Sarts, who testified last year at the U.S. Senate intelligence committee about Russian interference. "The moment somebody can question the integrity of the elections and the election result, democracy is in trouble," Sarts said. The federal government has tasked Democratic Institutions Minister Karina Gould with shoring up the electoral system against foreign meddling. "We are closely following how our allies are addressing these challenges in their countries to see what solutions may be right for Canada," Gould's spokeswoman Jordan Owens said. "The government of Canada continues to closely monitor foreign threats, including those that may impact the 2019 election and are working hard to ensure that Canadians can continue to trust in our democratic institutions." The government wants to bring "greater transparency" to the funding of political parties and political advertising and fundraisers, said Owens. The government wants social media companies to "address issues related to foreign interference in elections," she said. "They have taken some initial positive first steps, but more needs to be done." Relations between Canada and Russia are at a low ebb with the Canadian Forces commanding a NATO battle group in Latvia, part of the alliance's anti-Moscow deterrent in Eastern Europe following the Kremlin's annexation of Ukraine's Crimean Peninsula in 2014, and the ongoing turmoil in eastern Ukraine. Russia has threatened unspecified retaliation against Canada for its passage of anti-corruption legislation named in honour of the Russian whistleblower Sergei Magnitsky. The Kremlin has also placed Foreign Affairs Minister Chrystia Freeland on a list of people banned from travelling to the country because of her writing about Putin during her former career as a journalist. But there's one positive in Canada-Russia relations: The Trudeau government and the Kremlin view the Arctic as an area of co-operation. That contrasted with the view of the previous Conservative government, which viewed Russia's motives in Arctic with suspicion after it planted a flag on the North Pole seabed in 2007. The Russian embassy and Global Affairs Canada co-hosted a conference at Carleton University in Ottawa on Arctic issues in November 2016. It was part of the Liberal government's plan to re-engage with Russia in what it saw as an area of shared interest. Both countries say they need to work together because thawing Arctic ice will mean greater ship traffic, which will increase the potential for oil and gas exploration, as well as potential threats on the environmental and security fronts. Sarts suggested Russia's co-operative overtures on the Arctic can't be taken at face value, despite some very public positive vibes between the two countries. "Take a look at narrative on the Arctic within Russia itself. There is a more or less the notion of 'that's ours'," said Sarts. "Co-operation is not the word you hear much." The NATO communications centre, headquartered in Riga, Latvia, was established in 2014 to combat Russian misinformation in the wake of its annexation of Crimea. It is one of three NATO research organizations, separate from its military command, that aim to counter Russian cyber warfare, along with the European Centre of Excellence for Countering Hybrid Threats based in Finland, and NATO's cyber defence centre in Estonia.